A sweet-tart dressing over beans and peppers topping a delicious spaghetti squash = YUM! 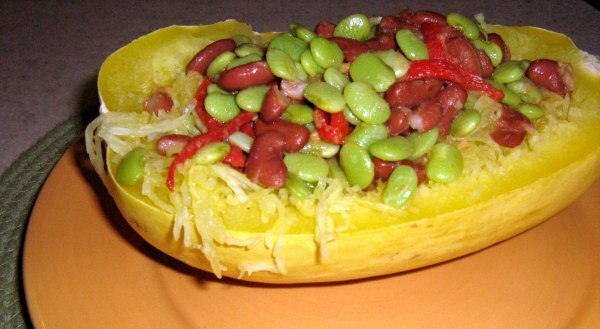 This spaghetti squash with balsamic beans recipe makes for a delicious dinner meal. There are a ton of recipes for cooking spaghetti squash. Many of them call for baking the squash for as much as an hour or more. Well as the saying goes, "Ain't nobody got time for that!" At least not in the evening after working all day, right? This recipe is quick. The squash only "cooks" or actually steams, for about 20 minutes. Meanwhile you prep all the other ingredients and your spaghetti squash and beans dinner comes together in no time at all. Traditionally people seem to use a red sauce of sorts on spaghetti squash because, after all, it is SPAGHETTI squash! And that's okay. We love it like that too. But making this balsamic dressing and combining it with the beans just allows for something a little different. A little change-up. And it tastes pretty good too. We think you'll like the spaghetti squash adorned with these great tasting, sweet-tart, balsamic beans. Place the squash halves in a large Dutch oven with an inch or two of water. Bring to a boil. Cover and cook for 15 to 20 minutes or until tender. Meanwhile (here's that "meanwhile" part), in a large saucepan cook the lima beans according to the package directions. Add the kidney beans during the last three minutes of cook time. Then drain and return to pan. Stir in the roasted red peppers and salt; heat through. Meanwhile (yes, another "meanwhile" moment), make the vinaigrette by combining the oil, vinegar, mustard and garlic in a small jar with a lid. Close the lid and shake well. Pour over the warm bean mixture and toss to coat. Use a fork to scrape the squash pulp from the shell in strands then return the strands to each shell. Spoon the warm bean mixture atop the squash strands and drizzle any excess vinaigrette on top. Sprinkle with fresh ground black pepper and serve. Options - you may want to try adding a sprinkle of crushed red pepper flakes to the top or some roasted pine nuts. A light sprinkle of parm also goes well. Makes four servings which means you should cut each half in half again! values" Vitamin A - 9%, Vitamin C - 94%, calcium-6% and iron-42%.